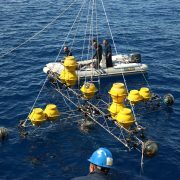 Last week, an extensive sea operation took place to deploy several elements of the KM3NeT/ORCA detector at the KM3NeT-Fr site, about 40 km offshore from Toulon. Amongst them, the first detection unit of ORCA comprising 18 optical modules, spaced at 9 m along a 200 m high vertical neutrino detection line. The deployment and connection of the detection unit was performed with the aid of a surface vessel and a Remotely Operated Vehicle (ROV) operated from a second boat. At the Hannover Messe, 24-28 April 2017, the Dutch KM3NeT team proudly presented the KM3NeT technology. 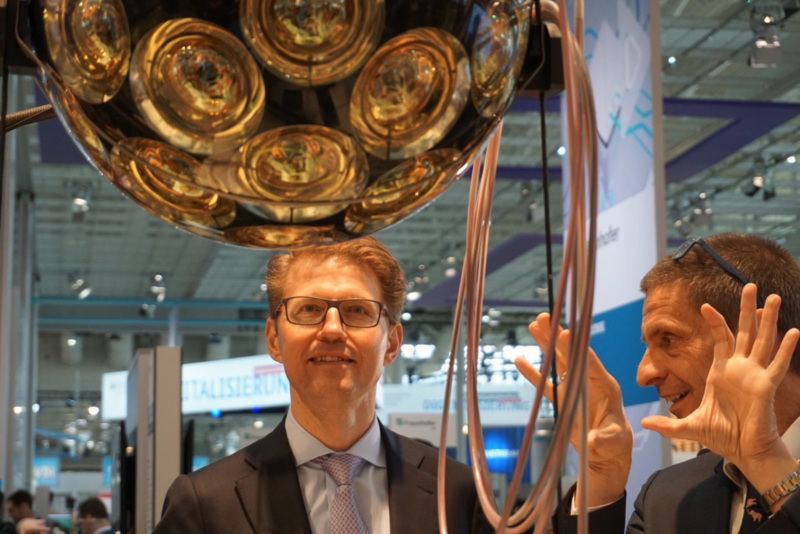 The KM3NeT exhibition stand was part of the Dutch Pavilion of this large industrial show and attracted the interest of the Dutch minister of research Sander Dekker (photo). 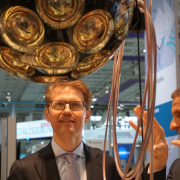 The Hannover Messe offered a unique opportunity to share with a broad industrial audience the technical challenges and production opportunities of building the KM3NeT telescope in the deep seas of the Mediterranean. In April 2017, the global neutrino telescope community realising telescopes across the globe, made important progress at two locations very distant from each other. 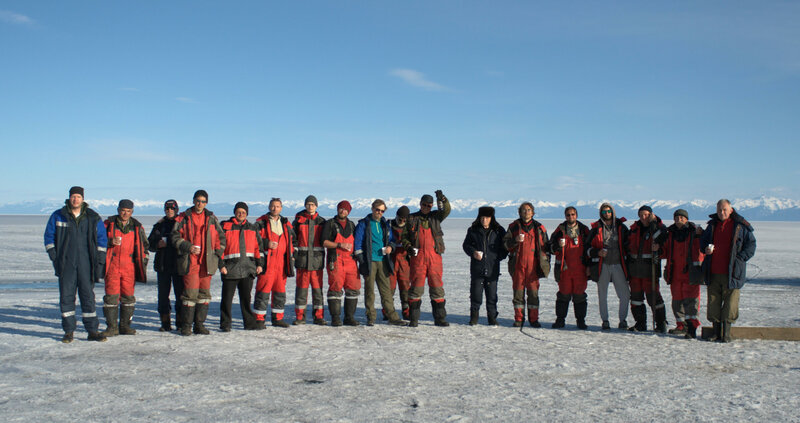 On April 9th, after an intensive deployment campaign, the Baikal GVD neutrino telescope in Lake Baikal, Russia has been successfully extended with a second cluster of detection units. The telescope is now taking data with a total of 576 optical modules. 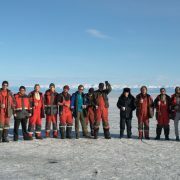 The KM3NeT Collaboration congratulates its Russian colleagues for this important achievement. 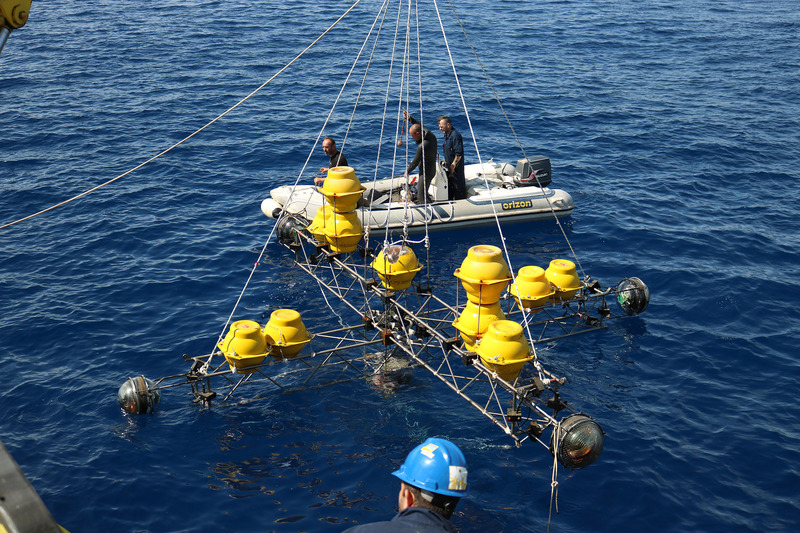 Two days later, on April 11, in the Mediterranean Sea, a team of Greek KM3NeT physicists successfully recovered a prototype detector from a depth of 3000 m, 16 miles west of Pylos, Greece. 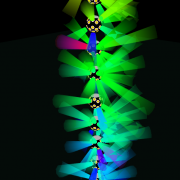 The detector with 8 optical modules operated autonomously on batteries during four months. The collected data are currently being analysed. 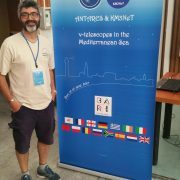 The KM3NeT Collaboration congratulates its Greek partners for this important step toward realisation of the future KM3NeT-Gr site. 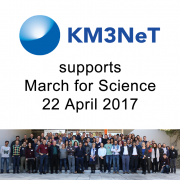 On 22 April 2017 scientists, concerned citizens and science lovers will march to celebrate science and to stress the need for support and safeguarding of the global scientific community. 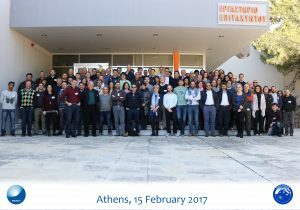 27 February 2017 – Three times a year, the researchers of the ANTARES and the KM3NeT Collaborations come together for a week to discuss the latest physics results of ANTARES, to report on the technical progress of building KM3NeT and present latest developments in the KM3NeT simulations. 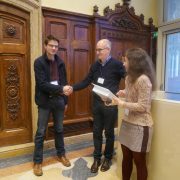 In preparation for the upcoming conferences, scientific results are scrutinised and debated in detail until everyone is convinced and satisfied. At these Collaboration meetings, new members and institutes are welcomed and farewell given to those that move on in their career in or outside academia. In addition, new science and project management is elected, work group leaders are appointed and opportunities for funding in the various participating countries are exchanged. But above all, the meetings are the opportunity to talk to each other face-to-face over a coffee, a beer or a nice Collaboration dinner. To get a flavour, watch this video by Eliza Gritsi. 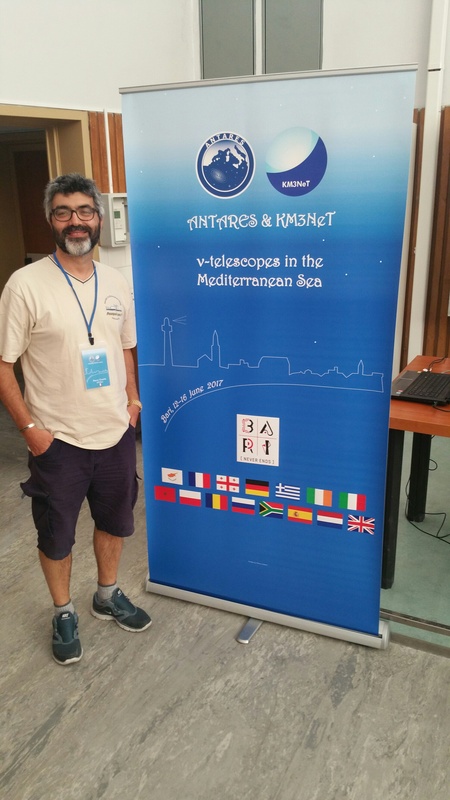 She recorded an impression of the ANTARES and KM3NeT Collaboration meeting hosted by the Institute of Nuclear and Particle Physics of the National Research Institute ‘Demokritos’ in Athens. 15 February – This week the researchers of KM3NeT are together in Athens to discuss physics and technical details of the observatories. 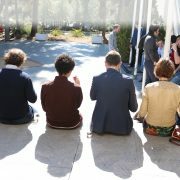 The meeting is hosted by the Demokritos national research center of Greece. An appropriate classical name for our (astro)particle physics research facility. 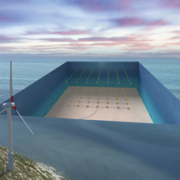 14 February 2017 – Recently, a feasibility study for the envisaged zero-carbon footprint of the KM3NeT research infrastructure has been funded by the EU in the framework of the Horizon 2020 programme. 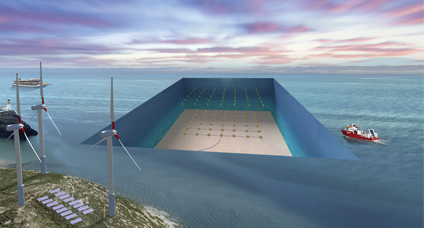 14 December 2016 – In the context of its H2020 program, the European Committee approved a project to establish within three years the KM3NeT Research Infrastructure as a legal and sustainable entity.